The first functional integration prototype of the Advanced Diesel Electric Powertrain (ADEPT) collaborative research project will be displayed in public for the first time this week by Ricardo at the Low Carbon Vehicle Event (LCV 2014) – the UK’s premier showcase for next generation clean and fuel efficient vehicle technologies. 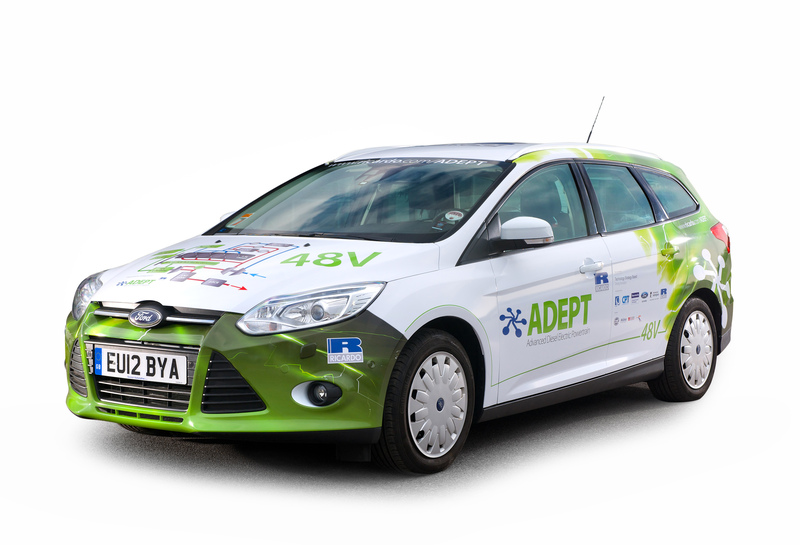 The ADEPT project was launched in 2013 to demonstrate the potential for 48V based intelligent electrification in delivering full hybrid-scale fuel efficiency from a highly cost-effective package. 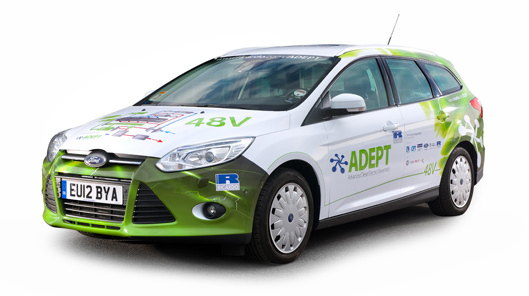 As the project approaches its mid-point, the research team – led by Ricardo and including Ford Motor Company, Controlled Power Technologies (CPT), the European Advanced Lead Acid Battery Consortium (EALABC), Faurecia and the University of Nottingham – has completed the build of the first functional integration prototype ADEPT vehicle. Based on a Ford Focus Estate, this ADEPT prototype incorporates a 48V electrical architecture, a SpeedStart 10kW (later to be upgraded to 12.5kW) belt integrated starter generator and TIGERS turbine integrated exhaust gas energy recovery system, both switched reluctance machines supplied by CPT, and an advanced lead carbon battery pack provided by EALABC. The supporting systems for electrical and vehicle integration include a 12V-48V DC-DC converter and a Ricardo hybrid supervisory controller. With a planned completion of early 2016, the ADEPT project is supported by funding from the UK’s innovation agency, Innovate UK (the Technology Strategy Board), with balancing contributions from the project partners. 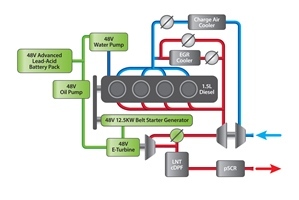 Engine downsizing through charge boosting is a well-recognized means of improving internal combustion engine fuel efficiency, by increasing the proportion of the drive cycle at which the powertrain operates within or close to the region of peak fuel efficiency of its operating map. An effective limitation on downsizing, however, is the delivery of acceptable driveability characteristics and launch performance. In the earlier ‘HyBoost’ project based on a similarly sized gasoline vehicle, Ricardo and its partners demonstrated fuel economy benefits equivalent to a full hybrid – but at a projected cost premium of less than a diesel. 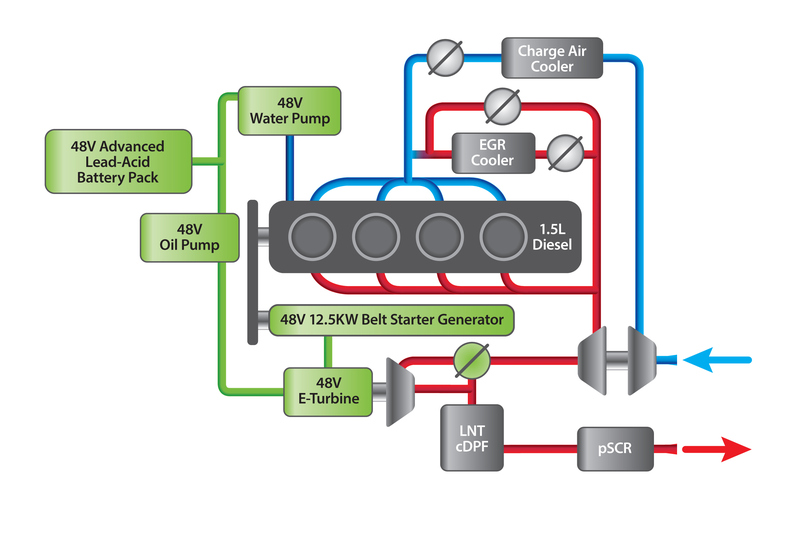 With the ADEPT project, the research team aims to demonstrate a powertrain with uncompromised performance and less than 70 g/km CO2 emissions as measured over the European Drive Cycle, but at a projected production cost significantly lower than a comparable full hybrid electric vehicle. In addition to the ADEPT prototype, Ricardo will also be displaying a range of low carbon vehicle technologies (stand No. C3-26, Hall 3 with an internal exhibition area and external vehicle display area) at LCV 2014 which runs from 10-11 September at the Millbrook proving ground. These will include the latest developments in Ricardo’s high speed flywheel energy storage, vehicle light-weighting and battery management system technologies. Additional vehicle displays – with some ride and drive opportunities – will include Ricardo electric and plug-in hybrid technology demonstrators, and the final prototypes of two previous research projects; Syner-D (cost-effective low CO2 premium segment diesel) and HyBoost (intelligent electrification of a gasoline powertrain).